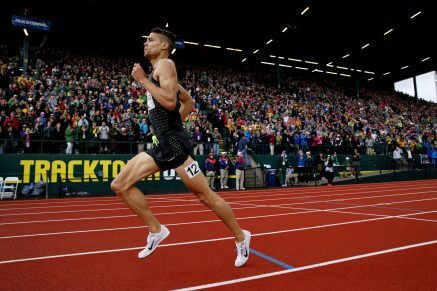 10th July 2016 – World Indoor Champion Matthew Centrowitz (USA) retained his American 1500m title and at the same time booked his place on the US team for the Rio Olympics. The final went out fast as only four athletes in the field held the Olympic qualifying time and the others knew this was their last chance. Matt was one of those with the time but even so he positioned himself near the front and always in contention for the lead. Passing the bell in second place Matt made his move just before 200m to run and looked a class apart from the rest as he cruised to victory in 3:34.09, a new Championship Record. In the women’s 1500m Shannon Rowbury (USA) qualified for her third Olympic team with a second place finish. Again in a fairly swift race Shannon showed all her experience to be in the right place at the right time and get the job done. Mary Cain (USA) finished 12th. In one of the closest finishes of the weekend Jenna Prandini (USA) held off a late challenge from Alyson Felix by just 1/100th of a second to take the crucial third place in the women’s 200m final and earn an individual spot on the team for Rio after being named in the 4x100m squad earlier in the week. The extra lift of having a large number of family and friends in the stands cheering her on never being more evident! After a busy few days that saw them contest both the 10,000m and 5000m events Galen Rupp (USA) finished 9th in the men’s 5000m final and Jordan Hasay (USA) 12th in the women’s event.